The presentation of your sunglasses is a crucial aspect of getting customers to purchase your product, and what better way is there to sell your products than with custom packaging. 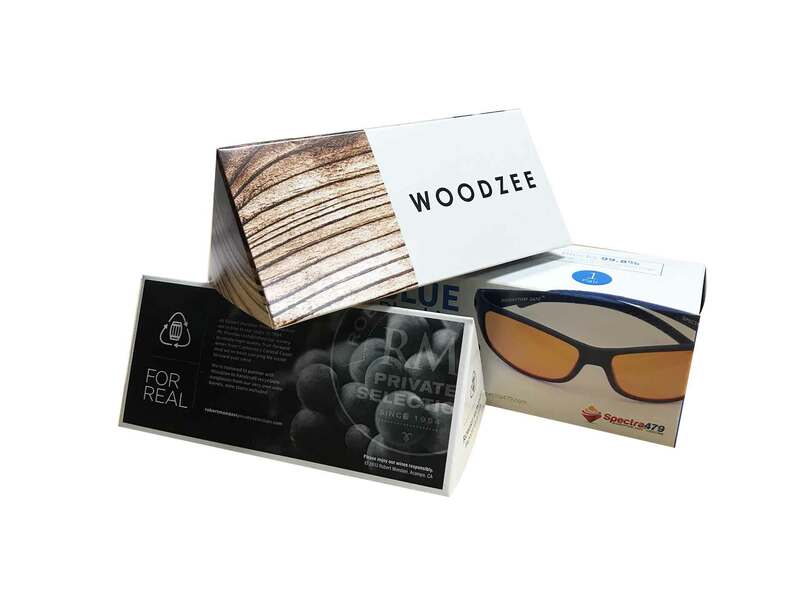 Box packaging for sunglasses can add a unique look to the sunglasses, but can also distinguish your brand from other businesses. With the full range of four color process, we can help make sure that the colors you want are shown as best as it can be on your sunglass boxes. Our wide range of box styles allows you to find the best suited box type for your product whether it be our popular straight tuck end box that is simple yet classic, our more unconventional triangle box design for a sleek and modern look, or tray and sleeve to add an elegant way of displaying your sunglasses. We give you the creative space in designing the perfect packaging as our team of experts is readily equipped to help you design practically anything you can imagine. In the end, our goal is to make sure that our clients will leave satisfied with their new custom printed sunglass boxes and glad that they chose us to make their custom packaging. We try to make that possible in an easy process with competitive pricing by showcasing our expertise, experience, and state of the art technology available to our clients. Here at Business Image Printing, we ensure you that our high-quality printing services will produce an optimal final product, emphasizing your brand. Also request what additional features you’d like to see on your boxes, and we’ll give you the cost!